If you’re looking for a great deal on a new or reconditioned Toyota forklift and you’re located in any Central or Southern Illinois county, you’re in luck with Bahrns ToyotaLift Southern Illinois. We serve most of Southern IL from our Effingham headquarters, including Cumberland, Clark, Fayette, Jasper, Crawford, Lawrence, Richland and other surrounding counties. At Bahrns ToyotaLift Southern Illinois we offer a complete line of new Toyota forklifts, the best in the industry, from heavy industrial outdoor vehicles to lighter, versatile forklifts for indoor/outdoor warehouses and docks, as well as materials handling equipment for any sized operation. Looking for a high quality used forklift? We can help! 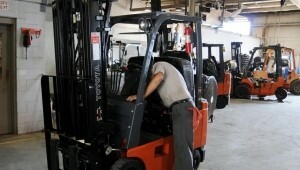 Bahrns ToyotaLift Southern Illinois is an authorized dealer of Toyota Certified Reconditioned Forklifts and equipment. Because we are an authorized Toyota Forklift dealer, we can provide our customers with the best deals, including special Toyota Forklift manufacturer promotions. Bahrns ToyotaLift Southern Illinois offers flexible leasing arrangements through Toyota Financial Services. Bahrns Material Handling Equipment & Supplies has been providing southern Illinois businesses and residents with top-quality materials handling equipment for more than 50 years. 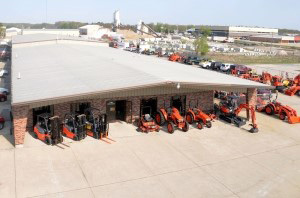 Since 1966, we have built our reputation as one of the leading suppliers of forklifts and other industrial equipment and supplies throughout Central and Southern Illinois. And now with our online website, we can offer the same great products to customers all over North America. To offer unparalleled service combined with quality products and terrific value. To serve our customers with all their material handling needs — from packing tape to forklifts. Our devotion to these principles has been with us since the beginning, and continued when we began selling Toyota forklifts in 1981, and later in the late 90s when we became ToyotaLift of Southern Illinois. For more than 50 years, the Bahrns name has been associated with quality, service, and integrity. We have been committed to serving the needs of our loyal customers throughout Central and Southern Illinois by providing the best quality vehicles, the largest selection of new and used Toyota Forklifts, the best deals, and superlative service. "ToyotaLift has taken good care of our business for several years now and were very happy with the service that they provide." "Their salesman has been working with me for a long time and has always been very helpful. I have no complaints"
Our loyal customers come back to Bahrns ToyotaLift Southern Illinois again and again because of our selection. We have one of the largest inventories of of genuine Toyota forklifts available anywhere, including everything from agile Class II Narrow Aisle and Class III Walkie/Walkie-Riders to heavy duty Class IV and V solid and pneumatic tire workhorses. 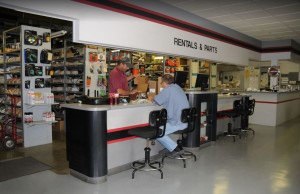 Business owners and fleet managers trust in Bahrns ToyotaLift Southern Illinois because they know they can rely on our decades of experience and outstanding customer service. Our staff is knowledgeable about every one of our forklifts so they can help connect you with exactly the right vehicle for your specific needs. As a leading forklift dealer of new Toyota forklifts, Bahrns ToyotaLift offers a complete line of tough, durable Toyota forklifts for every type of business, from the busy dock or distribution center to the working farm to light industrial or manufacturing. We also have the parts, service, and even driver safety training you need to keep your business running its best. Whatever type of hard-working Toyota Forklift you need, our friendly, knowledgeable, and helpful staff can help connect you with the perfect vehicle for your business. You can rely on Bahrns ToyotaLift Southern Illinois for all of your Toyota forklift needs. Bahrns ToyotaLift Southern Illinois also has a huge selection of used and reconditioned forklifts for your business. Get the same great Toyota quality and services at a fraction of the price. A used or reconditioned forklift offers a practical solution to many businesses’ operational needs without breaking the budget. Every one of our Toyota Certified used, reconditioned, and rebuilt forklifts has passed a multi-point inspection to ensure you are getting the same great Toyota quality and service. Our team of friendly and helpful forklift experts can match your business to the right vehicle to improve the productivity and efficiency of your business starting from day one. Sometimes it makes more sense for to rent a forklift, whether it be testing the vehicle for possible future purchase or as a temporary solution for a short-term project. ToyotaLift Southern Illinois has the forklift rental service your business can depend on, offering every size and type of Toyota forklift at the best terms available anywhere. From one-day rental to long-term lease, you are sure to find the right forklift for your business at ToyotaLift Southern Illinois. We’re the forklift rental service Southern Illinois businesses have trusted for more than 50 years. 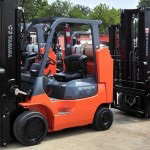 At Bahrns ToyotaLift Southern Illinois, we offer more than just the best new and used forklifts for sale or lease. We also offer forklift attachments and accessories, materials handling equipment, industrial machinery, and much, much more! But Bahrns ToyotaLift Southern Illinois has more than just the biggest selection of the best Toyota forklifts. We’re also the region’s leading provider of forklift attachments like boom lifts, carton clamps and carpet rams. We have forklift mounted self-dumping hoppers for use with transporting bulk materials or work platforms and loading platforms, and forklift sweeper and magnet mounted sweeper attachments that can help keep your business clean and safe. Whatever type of forklift attachment you need to improve the versatility and efficiency of your Toyota forklift, you can find what you need at Bahrns ToyotaLift Southern Illinois. Bahrns ToyotaLift Southern also has every type of industrial equipment and supplies to make your dock, warehouse, or business more efficient and productive, including materials handling equipment, forklift accessories, warehouse supplies, safety equipment, packing and shipping supplies. Since 1966, we’ve been the region’s most trusted provider of materials handling, manufacturing, packaging, and industrial equipment and supplies for businesses of every size. You can rely on Bahrns ToyotaLift Southern Illinois as your all-purpose industrial equipment and materials handling supplier. For any business, safety must be the Number One priority. For all your safety equipment needs, you can rely on Bahrns ToyotaLift Southern Illinois. In today’s online business environment, shipping products and supplies to your customers quickly and accurately is more important than ever. Bahrns ToyotaLift Southern Illinois has the solutions for all of your packaging needs, including stretch wrap, shrink wrap and tape dispensers; packing supplies and filler; straps and strapping tools; and the stretch wrap or shrink film machines for wrapping pallets and packages with ease. In addition to new and used Toyota forklifts, Bahrns ToyotaLift Southern Illinois also has a huge selection of materials handling equipment such as aerial lifts, scissor lifts, battery powered pallet jacks, and heavy-duty platform carts. Whether you are looking to buy or lease, we have the materials handling equipment solution for your business. We don’t just sell and lease Toyota forklifts. We service them as well! Our team of certified mechanics offer the maintenance and repair services you need to keep your forklifts and other materials handling equipment running their best, including preventative maintenance and repair services on pallet jacks, scissor lifts, aerial lifts, stretch wrap machines, and more. Not ready to buy or only need a particular type of equipment for a single job? Bahrns ToyotaLift Southern Illinois’s rental division has the solution! Now you can rent scissor lifts, aerial lifts and other equipment for as long as or little time as you need it. Call Bahrns ToyotaLift Southern Illinois to learn more about our comprehensive equipment rental services.